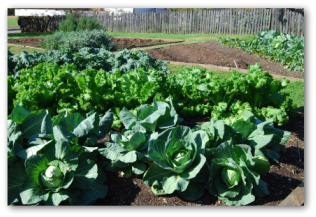 Here are a few easy tips for growing cabbage plants in your backyard vegetable garden! 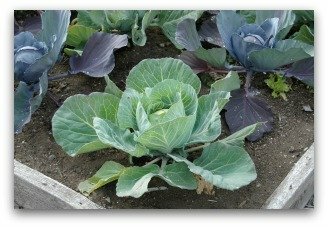 Learn how simple it is to plant and care for cabbage for great gardening results. 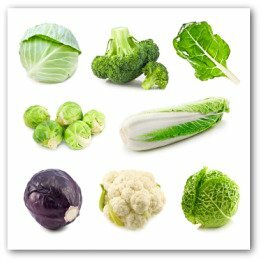 Cabbage is a cold weather plant, and a member of the brassica family along with broccoli, cauliflower, Brussels sprouts, kale and turnips. It is also a very hardy plant that will flourish in rich soil. The heads can be stored fresh for several months in a cool location, or can be made into sauerkraut and preserved by canning. Jumbo or Premium Flat Dutch cabbage reach maturity 105 days from plant setting. These are the largest of all cabbages. Few heads will weigh less than 12 pounds. The produce is flat, rounded at the top, and extremely solid. This variety is excellent for keeping all winter long as firm as the day you stored it. 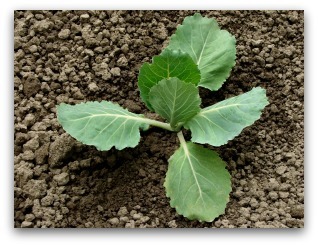 Sow cabbage seeds in early spring. You should only need about a dozen plants for an adequate harvest, unless you are planning to make lots of sauerkraut! To allow for a percentage lost to poor germination and weaklings, sow about 18 seeds in 4 inch pots filled with commercial potting soil. Set the pots in a bright, warm location. When the seedlings are about one inch high transfer them to individual spaces in six packs. They grow very rapidly in indoor heat. A week or so before transplanting the cabbage into the vegetable garden, begin the hardening off process. When you harden off plants it gradually toughens a plant's cell structure by exposing it to controlled cold weather conditions slowly. The cabbage will be ready for the open ground in about four weeks from germination. Cabbage needs nutritious soil if it is to produce a delicate, tender head. Work in two inches of well aged manure or compost and 10-10-10 fertilizer of about 5 pounds to 100 square feet. Preparing the soil properly will keep the cabbage fed during their entire growth period. Work about four handfuls to a six foot row of ground limestone into the soil to help the cabbages ward off clubroot disease. Plant your cabbage seedlings at spacing of 18 inches leaving three feet between the rows. The plants will need all this space to reach their full maturity. Meanwhile, there is ample room to grow a lettuce crop between the cabbage seedlings. Once the seedlings are put in the garden bed, give them a drink of water and liquid fertilizer mix to aid healthy and speedy growth. 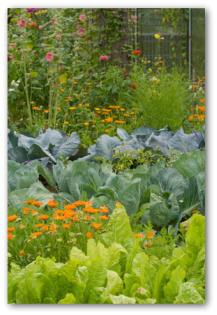 Be sure to rotate your garden crop placement each year. This will help prevent soil borne diseases from attacking your garden. Cabbage face the same dangers that their cousins' broccoli does. Give the plants a cutworm collar to defend the plants' tender stems. Bacillus thuringiensis given at 7 to 10 day intervals helps control pests such as the cabbageworm caterpillar. Applying diazinon at 10 day intervals controls root maggots. Many avid gardeners report having good luck using a root maggot mat, which aids in controlling the cutworm as well and cuts down on the use of chemical pesticides. One of the most important tasks for maintaining healthful cabbage is ongoing pest control. If root maggot discs are not used, drench the soil with a diazinon solution at ten day applications to combat this omnipresent insect. It is also necessary to continue spraying with Bacillus thuringiensis at 7-10 day intervals against the imported cabbageworm caterpillar. Some years you may have enough space in your vegetable garden to grow midsummer cabbage plants. You can start this crop from seed sown a month after transplanting your initial seedlings in the garden. To prepare a six foot row, work in two handfuls of 5-10-5 fertilizer and twice that amount of ground limestone. A row 6 feet in length will produce four huge cabbage plants. Although, the soil is already reasonably sweet from your earlier soil preparations, the extra limestone helps to control the much dreaded clubroot disease. Sow a cluster of 4 to 5 seeds two feet apart. 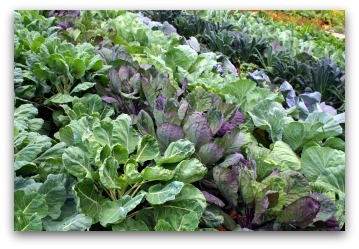 The later cabbage plants need extra vegetable gardening space because they produce larger heads than the first sowing. As you sow the seeds, water the soil with diazinon solution, which you will repeat every ten days or so throughout the summer. If you decide against using chemical insecticides, slip a root maggot mat around each saved seedling when you thin the cabbage plants to one plant at each side later on in the coming weeks.